To stay and be with you." Thanks ~Innos01 for giving the advice. I want to use your picture for a banner. How can I buy you this right? Is this the picture from national geographic's magazine cover?? i remember seeing it somewhere. There was even a documentary about the girl's eyes. Yeah,she's arab. The picture was taken when she was 17 or so. After a few years,they went back to her country to find her. She was already 40 or 50 something. It was a long time ago. oh my... you have very beautiful eyes! 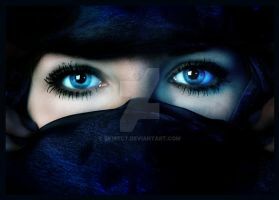 The color of the eyes is beautiful. wow...your very pretty! you should go into modeling! Unfortunately you didn't win but I've featured your entry in this News Article in the 'Honourable Mentions' category. This has been featured in my Friday's Fantastic Features for this week. [link] The subject is "eyes" and the images of what I first notice about a person when I meet them. Keep up the great work!! Ooh i loveee it. So pretty.